Europa Shield 2017: Bec win Gold! 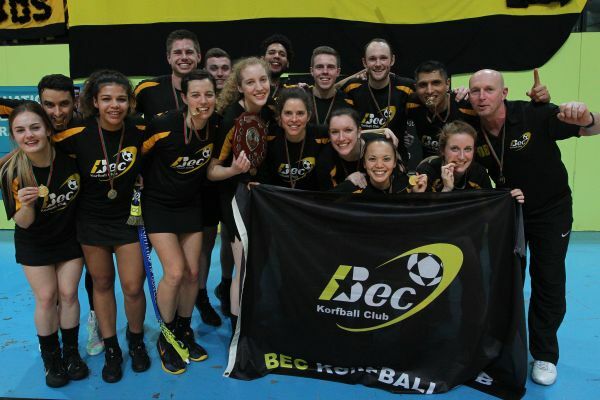 Bec Korfball Club from Tooting, London won the IKF Europa Shield 2017, reclaiming the title that the club won two years earlier. Bec’s opponents in the final were Schweriner KC from Germany. Bec and Schweriner had already met in the opening match of the tournament, which Bec won 13-12. The final was intense – the scores were level (9-9) after normal time. Which meant the winner would be decided by Golden Goal or even penalties! Bec made the worst possible start to the final after Schweriner took an early 3-0 lead and went into the half-time break ahead 6-3. The second half started perfectly for Bec with Caitlin Fitzgerald and Ana Rocha scoring to reduce the deficit to just one goal. The teams continued to trade goals throughout the half – it wasn’t until the last minute that Bec equalised with a goal from England senior international Blake Palfreyman. Bec’s defence (Bedford, Palfreyman, Roberts and Fitzgerald) successfully withstood three attacks from Schweriner before Hoyei Chow won a penalty for Bec. Up stepped Ben King… unbelievably King missed the penalty! But still managed to win the rebound to continue Bec’s attack. Seconds later King made up for the penalty miss with an open play goal scored from 5 meters. The goal signaled the end of the match. Bec had won the Gold medal. King was mobbed by his team-mates, substitutes and coaching staff – the celebrations then continued for some time! England international Joe Bedford top scored for Bec in the final with 4 goals, to take his tally for the tournament to 24. Congratulations to Bec Korfball Club from everyone at England Korfball. Europa Shield: Bec make history and win GOLD!